I thought that perhaps the PH 11am registration numbers would be down, with the Monster Stack event at the WSOP starting at noon, but there were enough players in town with one reason (or 1,300) that they weren’t going to play it. Personally, I have to be back in Portland on Saturday, so starting a four- (or five-) day event on Thursday wasn’t an option. Maybe next year. The game got off to a fast start for me, picking up the first two hands and a couple thousand chips. What really got things gong tough was a hand with A♣8♣ where I had a flush draw on the flop and another player hit a set of fives. He called my all-in on the turn, only to see his tournament life slip away with another club on the river. At the first break, I was table chip leader, even after a final hand where another player was busted in a kings v aces matchup. I kept hitting the nuts on the river. That turned around a bit when I called an allin from the short-stacked player on my right with a pair of tens and he flipped kings to cost me about ten thousand. With the slow progression of the blind structure, though, I as able to build back up to T43,500 by the second break (three hours in). 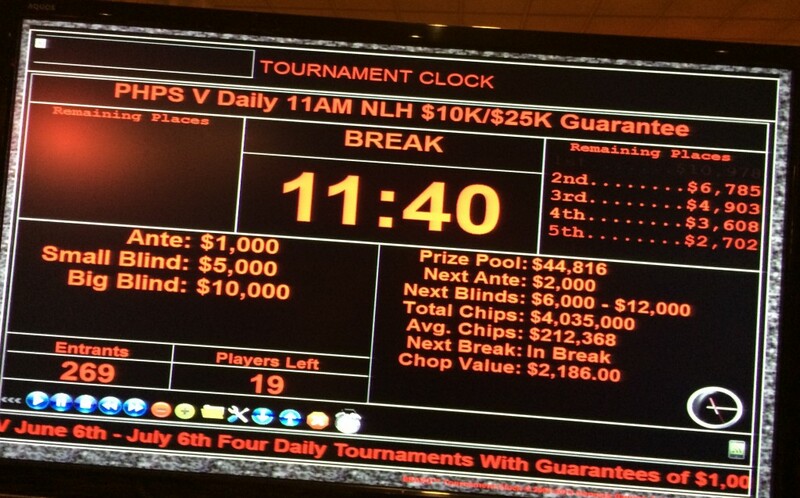 There were 175 of 267 entries left, according to the clock. Then I made a huge mistake against the same player I’d doubled up. I’d noticed that the dealer had missed my ante UTG, and she counted it then said I’d get good karma for it. Looked down at my cards and saw A♥K♥ and though that might be true. Raised and got called by BB, then saw a jack-high flop with two diamonds. I put in a continuation bet, nonetheless, and BB re-raised. I called, he got therest of his stack in on the turn, and he had A♦J♦ (a Mutant Jack turns against me!) and I lost all but T16K, at 500/1,000/100. I waited patiently, blinding down to just over T10K, then hit it big with KxKx in my BB and AxKx in my small, going back up to T40K. The final registration numbers were in, with 269 entries making a pot of $44,816 and a first place payout just under $11,000. 90 players left, with 27 paying, and I was about chip average. Got it all in again with JxJx fifteen minutes later from SB, big stack in BB called and we checked a bunch of low cards to the river, then I was up over T80K, with the average about T50K going to dinner break. Got AxAx allin over a short stack shove with Ax4x from UTG, then watched four cards to Broadway roll out for a chop. All his chips went to another player on the next hand in AxKx v AxQx. Aggravating. A table broke and the tournament chip leader was moved into the seat on my left with about T400K. I was close to the chip lead on the table once again before that, with an English player (two seats on my left) and an aggressive former short stack on the far end in close contention. Now we were all short-stacked by comparison. 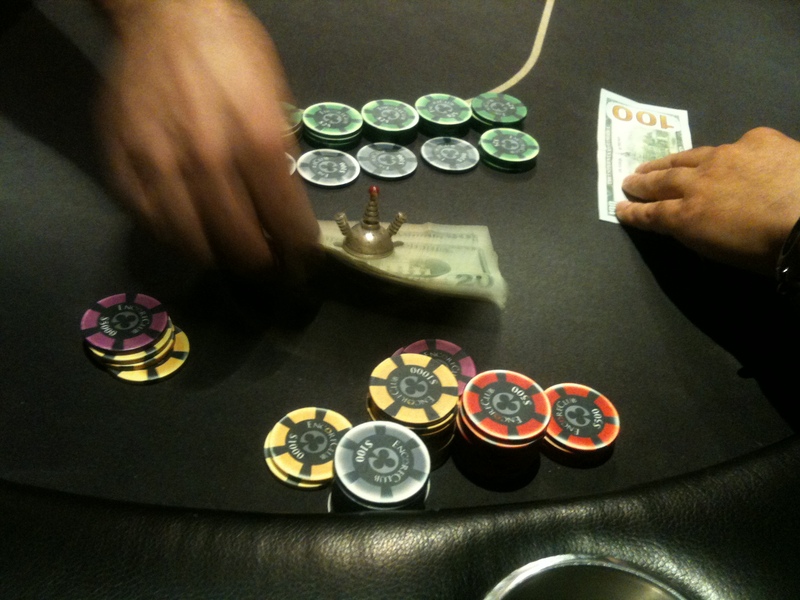 I had a A♥J♥ in early position, raised it without fear, he made a little speech, folded, and I took the blinds. On the second hand, while he was still unracking chips, I picked up A♦K♦ UTG. Again, I opened with a raise, 3x to T9K. He re-raised to T20K. Down the table, a stack about my size called his 3-bet. With nearly T60K in the pot, I shoved, the monster stack shoved, and the caller called because that’s what callers do. It was me against KxKx for the monster and Q♣T♣. The window card was an ace, and nothing changed except for the fact that I now had about T230K. Within about 20 minutes, we were down to 5 tables, still needing to lose two tables to the money. About T230K (the yellow chip s T25K). Max stack. I tried to sit back and glide, but a Mutant Jack caught my eye and I raised a hand, getting called by the Englishman on my left. The flop looked good, jack-high with two low cards and uncoordinated, buthe shoved over a continuation bet and I folded, concerned about a set or overpair. I had him covered, but barely. The hand probably cost me some good money; I checdked with him at a later point and he said he’d also had ace-jack. Meanwhile, the monster stack had been bleeding chips. He lost T100K to both the Englishman and the aggro guy on the otherend of the table, then busted short of the money. Been there. 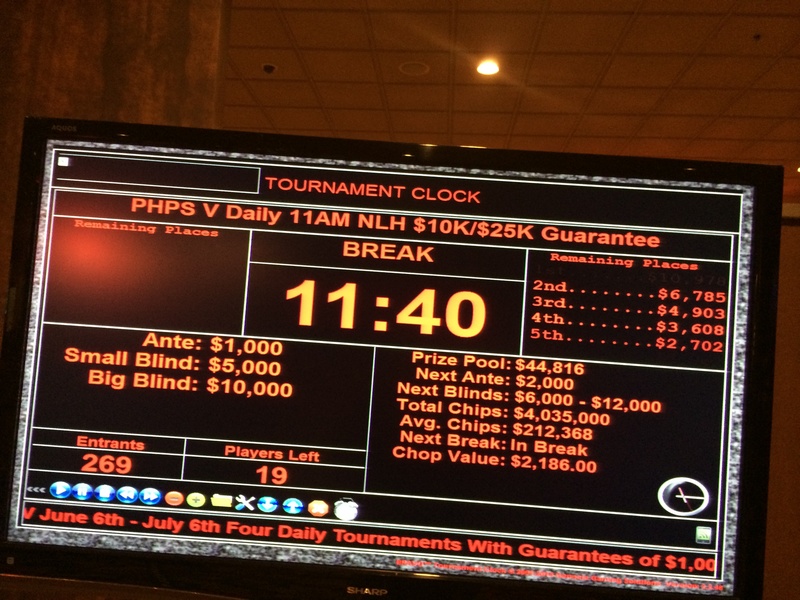 Meanwhile, over in the PH 7pm $100 buyin event, the $10K guarantee had 331 entries 2 hours in and a prize pool over $25,000. I folded most of the way to the money (we hit it about 11:15pm, over twelve hours in), but I was losing chips to the blinds. I knocked out a short player with K♥J♥ v A♣8♣ by hittng the flush, but had only T150K at the second break after dinner. AxAx again after break kept me alive, but after having a hand limped to my SB andshoving J♣9♣ into the older hippie with bowel trouble he kept bringing up (“Don’t be in the bathroom at the break”) he called with AxAx, which cut me down to T46K with blinds at T5K/T10K/T1K. QxQx on the next hand! There’s a shove from the other end of the table! I’m all in against Ax4x! He rivers a wheel straight! So, some mistakes, a less-than satisfying cash for thirteen hours of play, but a cash nonetheless. And a pretty decent tournament. Better once they get their own chip set instead of the ones from Caesar’s, with the nearly identical (to my color-blind eyes) T100 and T5,000 chips. Thirteen hours. 15th of 269 entries. 240% ROI. Because I only seriously started playing poker (after unseriously playing five-card draw thirty years ago and not knowing what I was doing–I mean even more so than now–the first couple of years I was playing No Limit Hold’em), I didn’t cut my teeth on online poker. I had accounts on a few sites by Black Friday, but nothing serious and nothing big; I think if my Full Tilt remission ever shows up, it’ll be under $20. But on one of my trips to Vegas last fall, I did put a small amount in the WSOP.com account I’d opened last summer, though because it was just after they got the site up and running, there wasn’t much going on, and I didn’t get a chance to play any of it, then I didn’t get back into Nevada until today. I was looking forward to it in par because now there was a lot more traffic, and because a former Portland player had great success in the WSOP satellites, winning two $1,500 seats and a $3,000 entry in the first half of the series, on total expenses of less than $200. I got into one this evening (after busting both the Wynn $30K guarantee and the $235 Rio Deepstack) and could see I was seated to the right of the afore-mentioned player for a coupleof hands while he felted a player and was moved to another table opening up. Then the guy who rebought went all-in with 8xTx on a Tx4x3x flop against my A♦T♦ and caught two pair on the river, so the parameters of my evening were set. 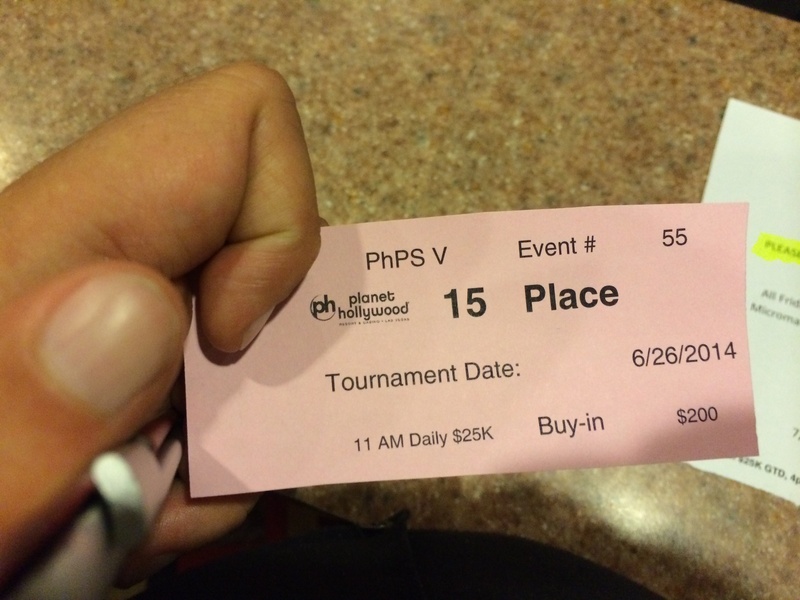 I busted out of that tournament after two rebuys and an addon in something like 75th place out of 91. An hour-long wait in the line for my Dollar rental car (I’m not linking to them) made the two-hour flight wedged into a middle seat seem almost like heaven. It also meant that I drove straight from the airport to the Wynn for the noon game, getting there not too long before the line of alternates started up. The I had to zoom over to the Rio (where I let my kings get cracked by 6♠9♠), after I busted the Wynn just as reentries were ending. So I was hungry and even though there was another satellite (with just a $5 buyin/rebuy/addon) starting up in half an hour, I figured I could pop out, grab some food, and get back in time for the start. Managed to get myself lost a couple of times getting to the Von’s for some Diet Coke, ran into the divided eight-lane roads near the airport (where else would a cheap HoJo be?) combined with unfamiliarity with this section of Vegas at night, and ended up getting back and buying in not too long before the break. I was doing well, although that was relative, because atthis buyin level, only one seat was going to first place, and second was getting $165. Blinds were climbing, I was UTG1, we were about to go on another break, and…the motel wifi died. I calmly went about trying to re-establish my connection. After all, I had 5 minutes on the break, it was probably just a transitory problem. The WSOP.com application seemed to be hung up and would close on its own. Okay. I couldn’t get connected to the HoJo wifi.Okay. I have a new iPhone 5s, I set up the personal hotspot and got connected. WSOP.com says I’m out of state and I need to turn LTE off on my phone. Okay. I turn LTE off and now the hotspot isn’t so hot. HoJo wifi still down. By the time I manage to see my screen again (but I can’t play it, because WSOP.com still thinks I’m outside Nevada because of the LTE) I’m UTG with less than 1BB. I finish 18th of 90. So, it’s back to the live action for me. Planet Hollywood in the morning, I think. I didn’t even know about this tournament until four days before it happened. I was idly checking the Encore web site and, boo, there it was on the screen. They’ve just discontinued their email notifications and gone to SMS, but I hadn’t seen a message about it. 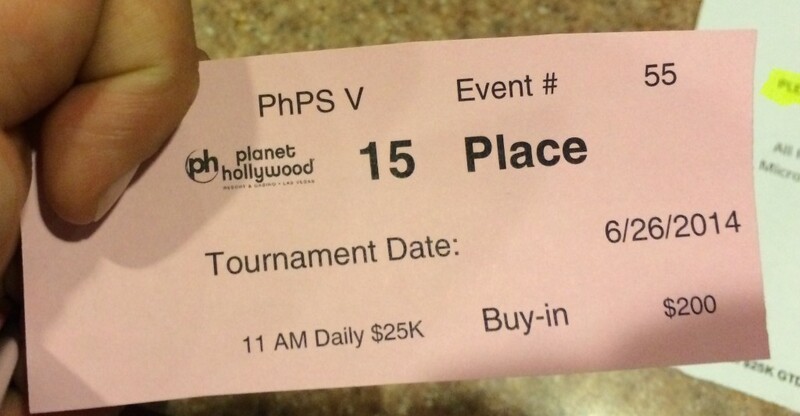 Went down the next day to buy my ticket, played the noon game and was the first player out, played their special $8K that night and busted less than half-way through the field when my short-stacked QxQx UTG shove ran into BB AxAx, then bubbled their 10pm $500 guarantee, which had a prize pool over $2,000 from all the players who’d busted the $8K. The $40K didn’t get off to an auspicious start. I picked up KxKx in middle position and three-barreled on a queen-high board, with two callers, only to have an ace pop up on the river and lose to AxTx. The very next hand, though, I raised 6♦8♦ UTG1, and called a re-raise to get a gut-shot straight straight flush draw, making a flush on the turn and a straight on the river to crack AxAx. After that quick reversal, things started going my way. One woman tried to bluff my AxJx off a Jx7x2x flop when another deuce showed up on the turn, and the kid next to her ran into similar problems with his bluffs. The reg on my right, who I’d played with in the Deepstacks Main Event last fall kept getting to showdown with second best hands against me (and everyone else). Ninety minutes in, I was feeling frisky enough to raise 2x2x UTG, got two callers, and flop a set for a big pot that put me up to T30,000. Then things ground to a halt. Coming back from the break after two hours, I had T39K. I folded for three hours, getting down to about T20K, getting a couple walks, then, just after long-time reader BP moved to the table, I got AxAx in BB. The Talking Heads’ “Life During Wartime” was playing on the club speakers, and I sang out loud with David Byrne to “this ain’t no party, this ain’t no disco, this ain’t no fooling around” as I three-bet all-in. It must have looked suspicious—or maybe it was because my stack was less than half the chip average and his hand was strong—but the original raiser called with AxKx and I was up to T60,000 and back in the game. I jammed with AxKx from the SB on the next hand over BP’s raise. He had me well-covered, and I’d just watched Big Slick lose to me the hand before, but he laid it down. In another ninety minutes, I’d tripled that up to T180K, in good shape for making it to the money, at least. And it kept going up steadily as players busted before the money, hitting T230K by the seventh hour (although that was only about 20BB). Despite having discussed the perils of AxKx with me at the break after we hit the money, BP went out for a min-cash in 14th in consecutive hands against the same player, ending with AxKx v JxJx. I nursed my short stack to the final table, then doubled up with QxQx to T300K, about chip average. A deal was made for the final nine, with everyone guaranteed $4,500 (staying under the tax reporting guidelines), and an extra $3K+ going to be played out for first. 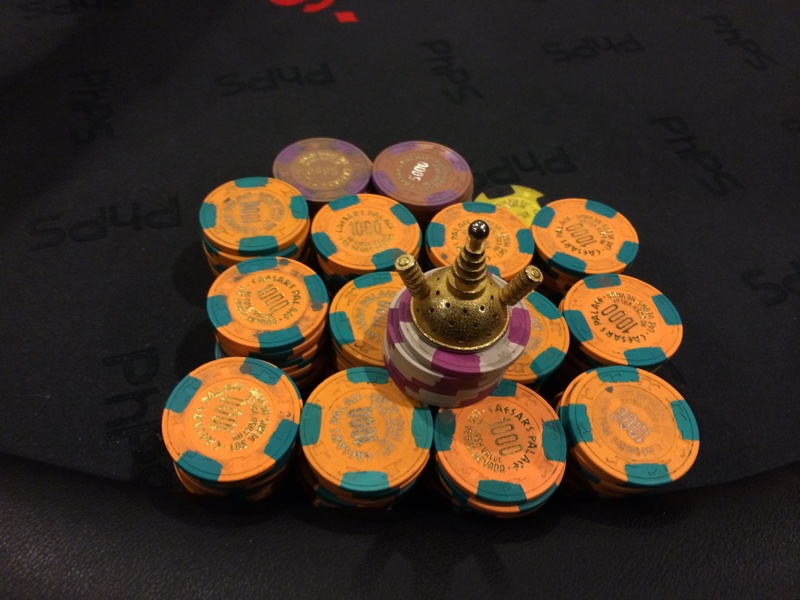 Stacks were getting short; with 3.25M in play, the average stack was only 18BB deep at 10K/20K/3K. Two players bit the dust, then there was a massive hand that knocked me out, with three players all-in after the flop covered by the chip leader’s J♥9♥. The short stack had AxAx, I had Q♦J♦ and another player had AxKx, the flop was queen-high with two hearts, and a heart on the river sealed all our fates. The final four remade the deal to distribute the extra money that was to go to first, which apparently still kept them under the reporting limit. Not my biggest cash in terms of ROI, but it sneaks in as the biggest gross cash of my poker tournament career so far, and just edges out my $10K first-place finish for profit. Deep runs in two big (for Portland) events in two weeks! Had to take my tournament screen photo before the money bubble broke because my phone was running out of juice. Eight hours and forty minutes. 5th of 174 entries. 1150% ROI. I’ve had some success in Final Table’s $10K tournaments over the past year, but in fourteen outings, I’d never been able to crack one of their bigger events until last night. They run a $20K the first Friday of the month. In months like May, with a fifth Friday, they run another, so you get the nice benefit of big tournaments for low buy-ins in consecutive weeks, this year just in time for the summer Vegas poker blowout. The game didn’t get off to an auspicious start, with the tournament software crashing just after the start of the second 25-minute level. The staff apparently hadn’t saved the game file, so even though things started off on time at 6pm, the tedious task of going through and figuring out who was where took over 20 minutes; we were just lucky that the crash didn’t happen further into the tournament after a bunch of rebuys, or after the break when add-ons were in play. My game started off decently but then I took a big hit and was down to 60% of the starting stack. The turning point for me was a lucky river Qx when I was all-in pre-flop with queens against kings. Lost most of my add-on after the break, but then floated pocket nines on a flop with two kings and made a full house on the turn, which got me all-in against trip kings. I kept on hitting sets through the night. Four hours in, just after the second break, a player who’d shown two pocket pairs of aces and a pair of kings ended up all-in against me with QxJx against my flopped set of tens, a hand that pushed me up to 110,000. 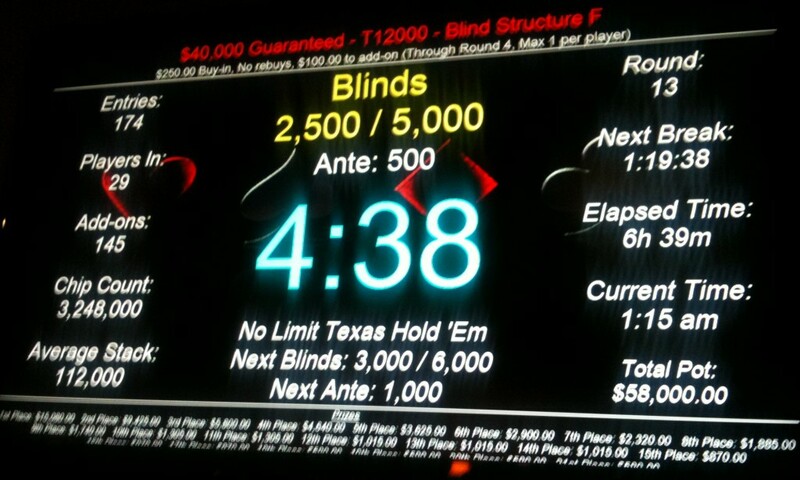 Five minutes later, I didn’t make much money but won a hand with flopped quad nines. I yo-yoed down to 70,000, up to 90,000, and back down to 60,000. Then luck struck again and I was all-in pre-flop with 9x9x against KxJx. The flop was AxQxJx and I was shoving my chips forward until I saw the dealer pushing the pot and the other player’s chips toward me, because I’d hit a flush. That put me back over 100,000. A button raise while we were six-handed at four tables was a gift. I raised from HJ with AxKx and got a call from BB. The flop was A♠8♠6♠ and I shoved, despite not having a spade. BB dialoged and tried to get me to answer questions, before finally calling after several minutes with AxQx, also without a spade. For most of his stack. I couldn’t complain. An hour later, seven-and-a-half hours into the game, action folds to short-stacked SB, who shoves with Ax6x. I have AxKx and call and knock him out, putting me up to 240,000. We hit the money bubble about ten minutes later. The tournament chip leader was on my immediate right at two tables, and he was raising liberally. Eventually, I shoved on him with QxQx and he called with AxKx. First card in the window was an ace, but the queen followed right behind and the rest of the board was low, doubling me up to the point where I had about a fifth of the 3.1M chips in play when we got to the 10-handed final table. A couple deals were floated, but there were holdouts for each one. Typically, because of IRS reporting rules, the prize pool gets chopped up so the players make less than $5K each, under the reporting trigger point, but not tonight. I was up to 900K at six-handed. The last point where an even chop of the money was less than $5K was at 4-handed, but the fourth player went out without a deal. I shoved KxQx from SB and got called by the short stack in BB with AxKx, then had to play the shortie myself, though to be true, nobody was particularly deep-stacked at 25,000/50,000/5,000 and only 60BB between the three of us. I still had about 10BB. My last hand was Tx4x in BB. The big stack limped in from the SB and I should have shoved, knowing that I couldn’t do any worse than third place and that he was likely pretty light, but I neglected to do it and thought I might be good with a ten-high un-coordinated flop. He checked and I shoved, but got Brunsoned when his Tx2x had flopped two pair. Like I said, I couldn’t do any worse than third at that point. Only about half the payout I would have liked. With other events putting a brake on my earnings the past month, my summer Vegas bankroll isn’t where it needs to be, but I’m still hoping to catch the end of the WSOP. Ten hours and thirty minutes. 3rd of 156 entries. 1563% ROI.